The buzz is mostly gone, and so is his beard. 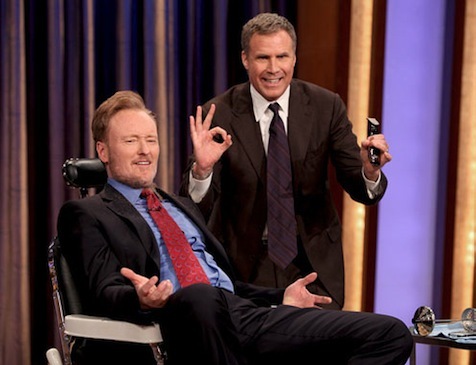 TBS is seeing to it, though, that Conan O'Brien's Conan will stay the course. The network announced Wednesday that the late night talker has been renewed through April of 2014. Conan premiered in November 2010, pushing comedian George Lopez's incumbent Lopez Tonight to a later hour. It since has been canceled. "I am excited to continue my run with TBS because they have been fantastic partners," O'Brien said in a publicity release. "This means I'll be taping episodes of Conan well into the Ron Paul presidency." TBS says that Conan has "enjoyed three consecutive months of audience growth" and also is a "true powerhouse when it comes to online activity and engagement." O'Brien's Twitter following is 5,020,000 and counting, the network noted, while the Team Coco Facebook page has drawn over 1.8 million fans. "Night after night, Conan and his team have put together terrific shows that draw a young and fiercely loyal audience," TBS programming head Michael Wright said. ***Simon Cowell and L.A. Reid, maestros of Fox's The X Factor, held a teleconference with TV critics Wednesday to announce they haven't yet hired anyone to replace the two judges and host fired after Season 1. But Cowell did make a bit of news by saying that hosts of opposite sexes would be named to replace the banished Steve Jones. "I always wanted a boy and a girl to host the show," Cowell said. "And I think that's definitely going to happen now." Replacements also must be found for Paula Abdul and Nicole Scherzinger. Rumored new judges have included the likes of Brittney Spears, Fergie, Janet Jackson and the late Whitney Houston. Cowell deferred to Reid regarding Houston. "It never quite came to that," he said of any actual talks with her. "There was an interest there, but we never had meetings about it." Charter American Idol host Ryan Seacrest is in the final year of his contract with Fox, but Cowell discounted any notion that he'd jump to another network or preside over any rival singing competition. "I think Ryan's brilliant at what he does. I think Ryan's also a very good negotiator, and I admire him for that," Cowell said. "He'll stay on Idol." Cowell tweeted on Feb. 16th that "maybe the winner of The X Factor USA this yr should compete with the winner of The Voice & Idol in a super final. Just a thought. I'd be up for for it." He's "disappointed" by the disinterest from the two shows, Cowell said. "I like the idea of superfinals . . . I thought it would be something different."